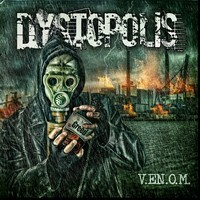 Home » Reviews » CD » D » Dystopolis - V.E.N.O.M. There are times when hybrids arise into Metal. The use of a main genre with influences from others on Metal is not a new feature, but from time to time, a sublime album appears to us all. And the German quintet DYSTOPOLIS comes to put the wall down and to defy some rules with the second album, “V.E.N.O.M.”. Their musical worked is based on an aggressive and Old School approach on Power Metal, with clear influences from ICED EARTH, BLIND GUARDIAN, and NEVERMORE, but more aggressive and with violent elements in many parts (that don’t destroy the melodic work of the band). So we can say that is melodic and aggressive, with the right amount of instrumental technique (now exaggerated as many old HELLOWEEN and GAMMA RAY clones that infest the scene), in a trend that is similar to POWERWOLF (without being a copy, of course). And “V.E.N.O.M.” is truly a good album, with its charming energy. The sound quality of “V.E.N.O.M.” is amazing. Yes, they worked in a way that everything sounds clear in the way the melodies and their instrumental technique can be understood, but with a clear aggressive and heavier approach for Power Metal. It’s another great work from Sebastian “Seeb” Levermann on the recording, mixing and mastering. We could say that if BLIND GUARDIAN is the band that explores the fantasy work from Tolkien and other writers from the same literary genre, DYSTOPOLIS work on films and books like “Mad Max”, “Blade Runner” and “Matrix”. And “V.E.N.O.M.” transpires this dystopian (and energetic) vibe on songs as “Black Gates” (a heavy and bitter song, with abrasive melodies and excellent guitar riffs), the charming harsh melodies of “Lords of Sand” and its excellent chorus, and the same elements can be found on “Dining With Gods” (a very good work on the interpretation of the vocals), the arrowed melodies of “Anthem for a Stalker” (they can reach your heart easily, and the work from bass guitar and drums is strong and technical here), and the violent and melodic embodiment of “Beneath a Black Horizon” (what lovely keyboards parts). These can be pointed as the album’s finest moments, besides all sogs are great. Do yourself a favor: hear “V.E.N.O.M.” out loud, and understand what DYSTOPOLIS is about. You won’t regret it for this excellent experience.